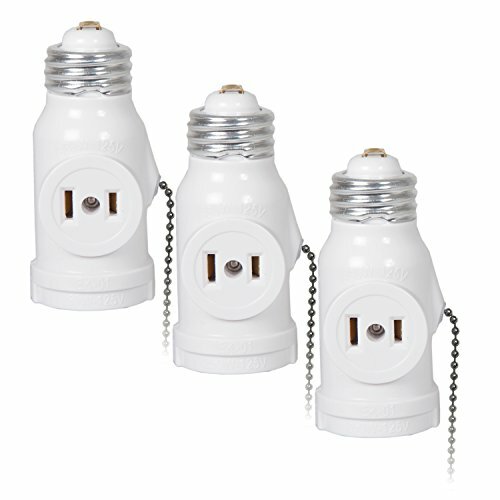 Maxxima Dual Outlet Light Socket Adapter, with Pull Chain, Turn E26 Standard Light Socket into Electrical Outlets (Pack of 3) by Maxxima at In The National Interest. MPN: 43239-207595. Hurry! Limited time offer. Offer valid only while supplies last. This is a two-outlet light socket adapter that allows you to use your light bulb socket as a plug outlet in addition to handling your lighting needs. This is a two-outlet light socket adapter that allows you to use your light bulb socket as a plug outlet in addition to handling your lighting needs. This extender has an E26 base that works with LED, CFL and standard household light bulbs. The additional two electrical outlet receptacles are an efficient way to add more versatility to your space. The convenient pull chain makes it easy to set up your area for temporary or long-term use. This product is UL Listed. Dimensions: 1.5"W x 3.3"H x 1.5"D, Chain Length is 6.8"
If you have any questions about this product by Maxxima, contact us by completing and submitting the form below. If you are looking for a specif part number, please include it with your message.